By adjusting the Guide pitch measurement range, we can "remove" the octave drops in the Guide's pitch trace. This will be done by raising the lower pitch range limit above the octave drops - so the lowest pitches will not be measured. This will force the pitch detector to measure the first harmonics of the actual pitch - which is one octave higher. 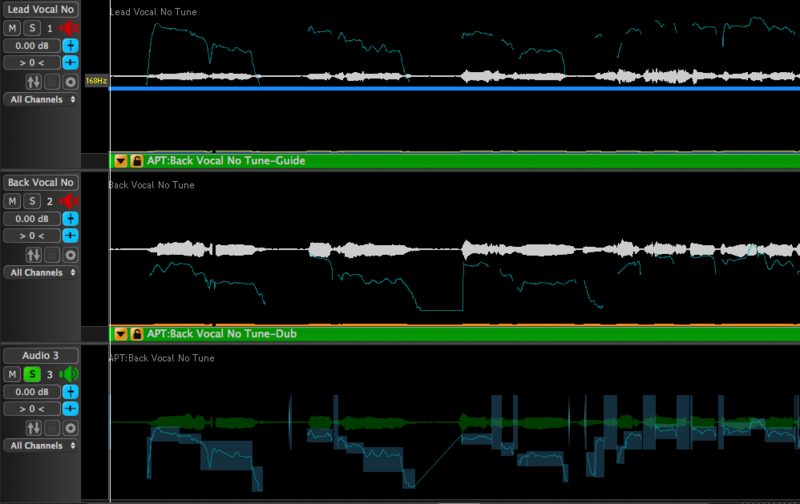 This pitch will generally provide the tuning contour that we want to apply to the "smooth" Dub voice. In other words, we "fool" the pitch measuring system into not creating pitch measurements that will result in artefacts in the Dub. However, there is a further important point to notice in this example. The Dub voice is actually sung an octave lower than the Guide. 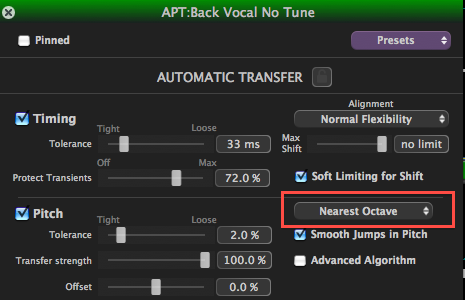 So if you are using Revoice Pro 4 in the Dialog Mode (shown here) the APT process must be set to use the Nearest Octave setting (shown below) to keep the Dub in the range it was sung in. 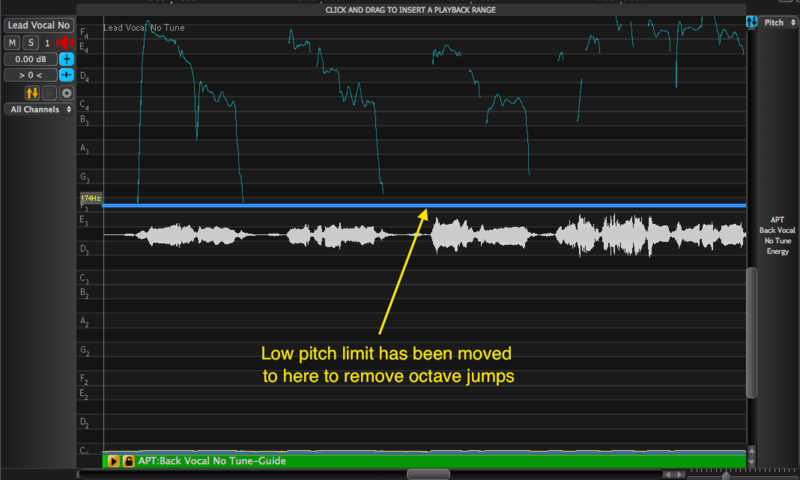 If you are using Revoice Pro 4 in the Music Mode, this problem might not occur. It is simple to "correct" the pitch jumps in the Guide graphically. We can graphically display and adjust the Pitch range limits. In the image right, we have brought up this menu by RIGHT CLICKing in the Guide track area, and then selected the APT name and then Edit Pitch Limits. 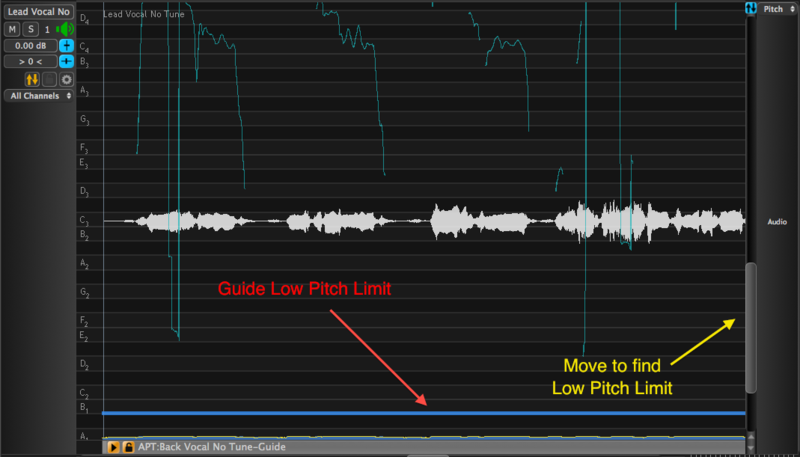 Once this is selected, as described in the previous examples, we have selected the track "Show Full Height" button, scaled the Pitch Range, and moved the Pitch Offset slider down to find the Guide "Low Pitch Limit" as shown in the image below. Once the Low Pitch Limit bar is shown, LEFT CLICK on it and, while holding down the LEFT mouse button, drag the line upward until it is higher than the octave jumps and let go of the mouse button. The pitch trace will be recalculated. The results of doing this are shown below - where the downward octave jumps have now disappeared and been replaced by pitch measurements that fit with neighbouring pitch measurements. 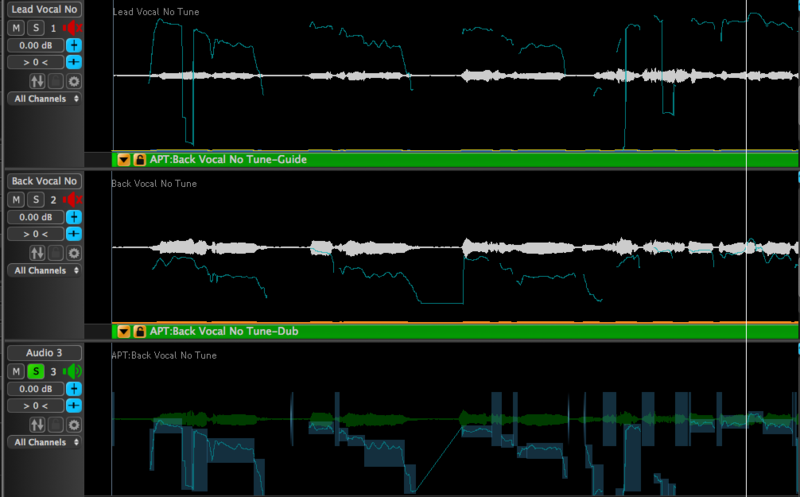 In the two following images, we show the Guide, Dub and Output tracks together, before and then after the Pitch Limit is raised.